Movies and television have really polluted the proverbial pool when it comes to preparing for a fight. We are so used to seeing the protagonist or antagonist effortlessly hack his way through combat that many of us are unwilling to accept that the stage is just an illusion. Reality is much different. 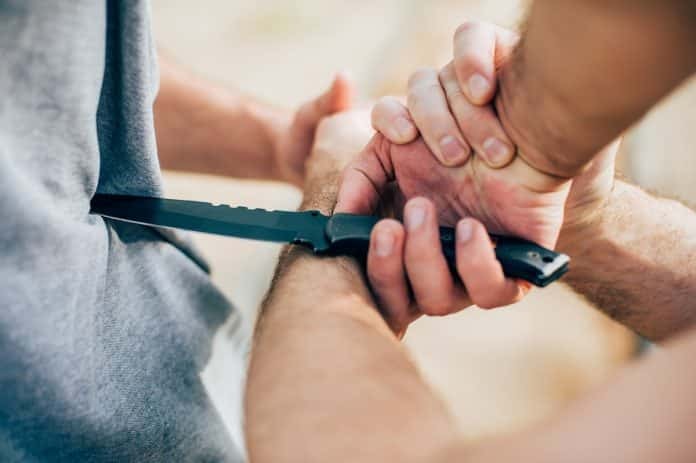 In this article, we dismantle seven of the most common myths we see about fighting with weapons in the hopes of better preparing you should you have to use them in your own self-defense. When confronting one or more attackers armed with sharp, pointy implements, go ahead and realize that if you stand and fight, you’re not likely going to be walking away. And if you do walk away, it most certainly won’t be without a fair share of deep and devastating cuts. The best thing to do if confronted with a knife is to run away. In the movies, two actors will dance around with blades before one exposes himself and the other plunges his dagger deep into the ribcage of his opponent. Devastating, sure, but not at all accurate or recommended. If you find yourself in a knife fight, your first priority is to stay out of range of your opponent’s sweep and take any opportunity to inflict even the most superficial cut. Another great thing about video games is how much they love to glorify the impact of cuts and slices. Yes, the sight of blood can undoubtedly force someone to reconsider their motives for pressing an attack. However, blunt force trauma delivered by either an improvised weapon or a dedicated weapon like an asp can have significant repercussions just as potentially lethal as a bladed weapon. Blunt force trauma inflicts wounds beneath the surface. Bones can be broken, tendons, nerves, and ligaments permanently damaged, organs burst. This and more can come by way of one or more directed blunt attacks. A haymaker certainly looks impressive. That’s the wild swing from left field, which when seen in person or on a YouTube video, looks like something that can’t be stopped. Well, it can. A haymaker uses a good portion of the person’s weight behind a punch. If it lands unimpeded, it can certainly do some damage. However, a haymaker also requires a huge setup. This is called “telegraphing.” If your opponent is kind enough to telegraph his next move, be doubly kind and put him down before he gets his momentum. Pepper spray, by itself, is a great non-lethal deterrent towards a potential attacker. It creates confusion and a decent amount of pain without any lasting effects. Because some menacing thugs seem to lash out even harder when they get hit with pepper spray, this weapon has been criticized as wildly ineffective. That couldn’t be further from the truth. In combination with martial arts training and a make-shift weapon, pepper spray is a great way to blind your opponent while you fight your way to safety. In fact, pepper spray is an ideal choice alongside an asp, baton, or even a broom handle. In boxing, the guy with the longer reach generally does win so long as he doesn’t drop his guard at a critical moment or lose momentum. A fight isn’t a boxing match. You’re not limited to fists. You can use feet, improvised weapons, anything and everything at your disposal to bring the fastest conclusion to the fight, neutralize your opponent, and secure your escape. In fact, if the guy you’re fighting does have a longer reach, that’s all the more reason not to let the fight become a boxing match. This is the biggest myth of all. There is an ardent belief by people who advocate against violence that it’s better to let your attacker win. After all, after he gets what he wants, he’ll leave you alone, right? You have no idea the level of depravity or lengths he will go to secure what he believes victory is. If you do fight, it is guaranteed that if he beats you, he will show you very little mercy. If you don’t, though, there is absolutely no guarantee. It’s your fight, your call. That’s why we fight to secure our escape, and we don’t fight fair. Previous articleAccidental Discharge vs. Negligent Discharge: What’s the Difference?